The most effective positions in labour are those that allow you to lean forward, use gravity, and open the pelvis. 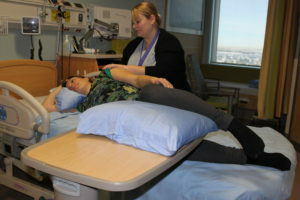 It can be helpful to change positions frequently – every 20 to 30 minutes during labour. This may decrease your pain and help your labour to progress faster. It can also help your baby get into a good position for birth. 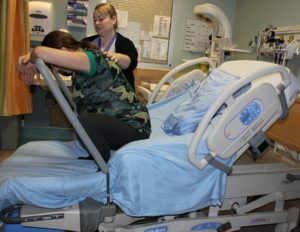 Often when a woman changes to a new position, her contractions will feel stronger, as the new position is helping the body labour more efficiently. She may need extra support and reassurance at this time. To help the baby move down during the second (pushing) stage of labour, try positions which use gravity, lengthen the torso, relax the pelvic floor and keep the tail bone mobile. If a woman chooses to use an epidural for pain relief her movement is usually restricted to within the bed. 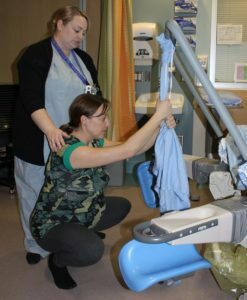 It is still important to change positions as it helps get the baby into a good position for birth. Even with an epidural in place a woman, with help, may be able to change from lying side-to-side and kneel or squat on the bed. Walking and standing are helpful in the first stage of labour. Gravity helps your baby to move down and makes contractions more effective. You may find it more restful to lean forward over something or someone. 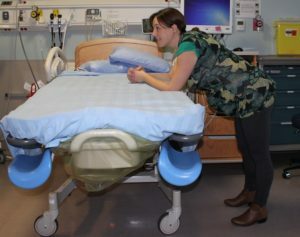 Sitting upright in the first and second stage uses gravity to improve your contractions and is a good resting position. However, it can worsen backache and hemorrhoids if you sit up too long. Leaning forward into your partner is a good position – you can have your back rubbed at the same time. 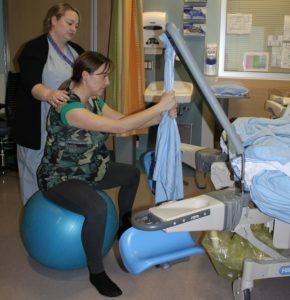 Using an exercise/yoga/birth ball to lean over and/or sit on, can help you use movement at the same time you are taking advantage of gravity enhancing positions. As you keep your pelvis moving, you are giving the baby more room to move down and add pressure to your cervix which will actually speed up the labour process. Sitting on the toilet or a birthing stool helps widen the pelvic outlet during the pushing stage. Kneeling forward in the first and second stages can help relieve backache and pain. It also helps the baby turn into a good position for birth. Tilting the pelvis with up and down movements in this position can also be helpful. Lying on your side in the first and second stages is a good resting position and a better position than lying on the back if mobility is restricted. You can combine this position with up and down pelvic movements to reduce discomfort. Try pulling your knees up and placing a pillow between them. Squatting in the first and second stage takes advantage of gravity and widens your pelvic opening to help your baby move down. Squatting can be done using the squat bar that attaches to the bed or as a supported squat using a birth ball, toilet or armless chair. Back labour is a term used when most of the pain of labour is felt in the lower back. It may occur if your baby is in a posterior position (the back of the baby’s head presses on your lower back or tailbone). You may feel extra pressure on your back during contractions or during the entire labour. Most babies in a posterior position will move into a better position before they are born. Using positions where the woman is leaning forward combined with counter pressure on the lower back can help relieve discomfort and help move baby into a better position. Unlike other mammals, the human birth canal is curved, and requires some maneuvering on the part of the baby. The baby enters the birth canal with his or her chin tucked toward its chest. As baby comes down the baby’s face turns toward the tail bone, and the head tips back as baby comes around the corner. Once the head is born, baby’s head turns back to align with its body for the birth of the shoulders. It’s interesting to note that if you’re lying on your back, the “corner” turns into a “hill”. You and your baby must both work against gravity to get the baby ‘up the hill’ and out. Also, the ligaments around your pelvis have loosened to allow for more opening, and also enables the tailbone to flex as the baby’s head moves past. The tailbone can’t flex fully open if you’re sitting on it. Positions that help the pelvis to open fully can create up to 30% more space in your pelvis. You may also find that changing positions frequently can be helpful to help the baby move down and through the pelvis. Positions such as squatting, lunging, kneeling or on all fours enhance gravity, allow the pelvis to open fully and the tailbone to flex. Side-lying allows for the tailbone to flex and allows some movement in the pelvis but doesn’t enhance gravity. Upright seated positions can enhance gravity but don’t allow for as much movement in the pelvis or for the tailbone to flex.